The vooPlayer platform currently holds 3 user licenses. Those are FREE, STARTUP and ENTERPRISE. Without any time or financial commitments, vooPlayer FREE allows you to create up to 5 videos, customize the player to match your brand, capture leads, display interactive calls to action as well as review insights. This ensures you have a solution implemented which you can scale whenever your demand increases. The Startup license is a great fit for smaller companies who have outgrown the FREE plan and want the advantages of some of the vooPlayer marketing, storage, and bandwidth solutions. Upgrading to Startup does make your videos more powerful by utilizing our Turbo Bandwidth Cloud Delivery Network (vooCDN) for faster streaming that gives adaptive resolutions to your viewers which change depending on their internet speed. You also upgrade your storage on the vooCloud to 25 GB so you have much more room for all of your video content, safe and protected and always available for your audience. For a complete breakdown of the features included in this plan, please see the comparison chart below. Upgrading to ENTERPRISE unlocks all vooPlayer Modules and Player Features. The upgrade removes all limitations, adds a lot more storage, activates API services, etc. Basically, you get everything that vooPlayer has to offer. 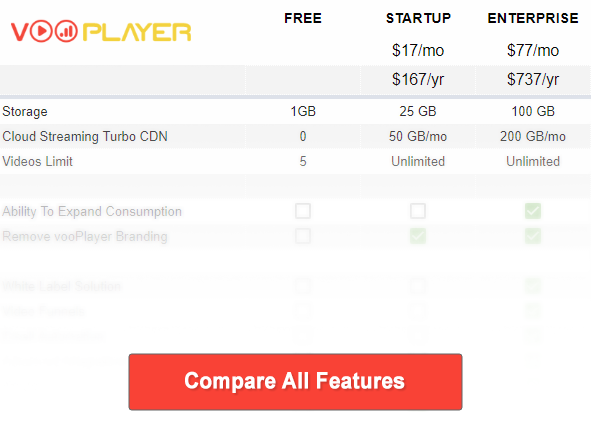 If you will require significantly larger consumption capacities and none of the plans seem like a good fit for you, contact us at support@vooplayer.com in order to put together a custom pricing plan for your needs. FREE has 1GB of storage on the vooCloud and unlimited regular bandwidth. STARTUP has 25GB of storage on the vooCloud, 50GB of Turbo Bandwith per month via the vooCDN, and unlimited regular bandwidth. ENTERPRISE has 100GB of storage on the vooCloud, 200GB of Turbo Bandwidth per month via the vooCDN, and unlimited regular bandwidth. You also have options to purchase additional bandwidth and storage capacities. (*Older Enterprise licenses may have less storage and/or turbo bandwidth).